Sure, between applications as full-featured as Bias Peak and AppleÃƒÂ¢Ã¢â€šÂ¬™s own Soundtrack not to mention freeware like Audacity, Mac users are a bit spoilt for choice when it comes to audio editors. But for those like myself who long for the simplicity and elegance of the long gone SoundEdit, Rogue Amoeba may just have the answer. Fission is the first (and currently only) OS X audio editor to support lossless editing of MP3 and AAC audio. 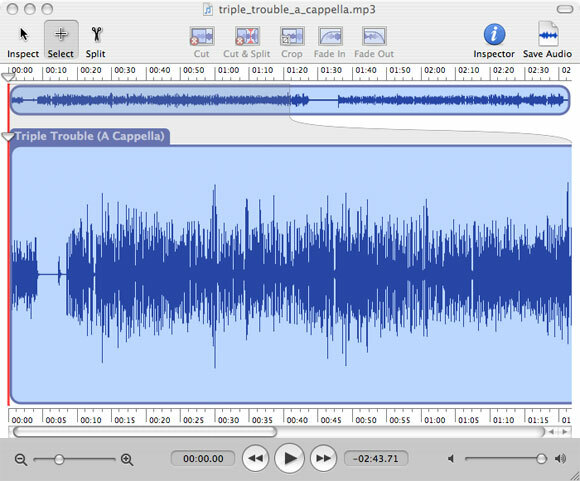 The software has a super simple interface which provides an accurate dual-waveform view and a handful of editing commands that let you split, cut, crop, and fade audio. While still clearly a 1.0 version, it does have some slick features including audible audio scrubbing. FissionÃƒÂ¢Ã¢â€šÂ¬™s streamlined interface is a joy to look at and use. Its only flaw may be that it is too stripped down for some. With a few more features, particularly support for VST and AU plug-ins, Fission could become my go-to audio editor for those times when bringing up Peak is just overkill. Fission works with mono and stereo MP3s, AAC, Apple Lossless and AIFF audio files and is available now as a Universal Binary that runs natively on PowerPC and Intel Mac for US$32.